Now an Amazon Editors' Holiday Gift Pick for Design, Construct, and Create! Paper is pretty much the least expensive craft material you'll find. It's also one of the most versatile. With a pile of colored sheets, a pair of scissors, and The Art of Paper Flowers, you can create gorgeous bouquets to give away or keep for yourself. For anyone who's an avid home crafter or future home-decor online vendor, this book will get your creative juices flowering, err, flowing. The Art of Paper Flowers makes it easy for anyone to create beautiful roses, orchids, tulips, and more--completely out of paper. 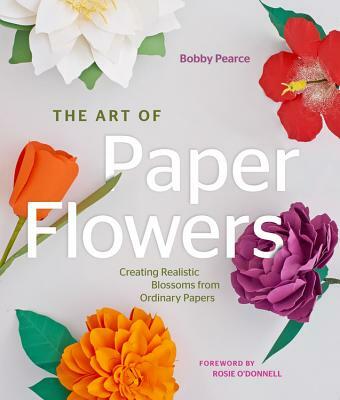 There are thirty-five flowers included in the book, and each pattern is accompanied by a complete list of materials required, step-by-step instructions for creating the flower, original paper-folding techniques from the author, full-size patterns, and color photos for reference. Additionally throughout the book, there are interesting bits of trivia, myths, or folklore for each delicate flower. The book also includes a foreword by Rosie O'Donnell. All the basic information is here in The Art of Paper Flowers for readers to make their own impressive paper flower bouquets. From mastering the skill of paper manipulation to achieving seamless gluing and coloring practices, you'll make flowers look incredibly realistic. Whether you're creating gifts, decorations for an event, or home decor, The Art of Paper Flowers will have you arranging stunning flowers in no time! BOBBY PEARCE has been a craft lover since he could hold a pair of scissors and has either mastered or dabbled in every craft (except knitting), which is exactly why Rosie O'Donnell featured him on her shows. As a designer Bobby received nominations for both the Tony Award and Outer Critic's Circle Award for the costume designs of the Broadway production of Taboo starring Boy George. Most recently his design work could be seen in THE CHILDREN OF EDEN at the Kennedy Center in Washington DC, as well as the 2014 Olympic Games in Sochi on numerous ice skaters including Evan Bates. Bobby lives in New York City. ROSIE O'DONNELL is an Emmy Award-winning television personality, actress, and comedian, a New York Times bestselling author, a mother of five, and a wildly enthusiastic crafter. She's also the founder of Rosie's For All Kids Foundation, which supports early childhood care and education programs, as well as Rosie's Broadway Kids, a program that brings musical theater to New York City public school children.